Man of Steel: "for a homeless guy, he's pretty cut..."
Sorry, folks, a few spoilers thrown about! Kryptonian tech was borderline magic...so very subtle and so very, very advanced. The way they expanded upon the Krypton events was genius. It was the biggest part of the origin story that we hadn't really seen much of so they just took it and ran. I wanted to be upset that they moved away from the crystal tech and went for a more organic look and feel but to be honest, the outrage was essentially intellectual and barely lasted a few minutes. A living, breathing Krypton (albeit what little we still saw of it) was an amazing thing to see. Moving on to Supes himself. He's got the look. The suit looked epic and boy, did they let Superman be Superman and it made Routh's version, whom I had enjoyed up to this point, look like Dean Cain's New Adventures... I've read a fair bit of flak about Cavil's interpretation of Supes and lack of personality but tbh, i dont see it. I think he was as perfect a cast as they could have hoped for, easily comparable to RDJ or any of the other Avengers. 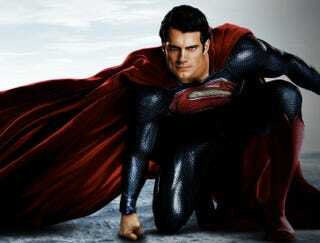 Cavil is definitely Superman now, for me. Zod and Faora were menacing as hell; Zod with the leashed craziness and Faora with the aloof, casual violence. Nom (?) was fun to watch but a non-entity which was a bit disappointing. waaay too long for what they showed. Some parts, while far from boring, just seemed to sag heavily. Could've easily been a two hour film and far tighter for it. second minor gripe; it was pretty dark towards the end. Metropolis really took it in the neck and whilst it was understandable considering the power levels being thrown around, I had a hard time imagining anybody wanting anything to do with Kryptionians after such a body count...not matter how well intentioned. Which kinda leads to my last SMALL complaint (and this one is kinda personal bias here). It was a little too much Dark Knight and not enough Avengers. There was a distinct lack of fun, or wit, to be more precise. As i said, totally a personal gripe here. Watching a Marvel movie is like watching a live-action comic book. This was like watching TDK all over again. Really grounded and played straight. This is NOT a bad thing... I was just hoping for more humor than we got. Supes and Lois killed it in their scenes but nobody else even really tried. Perry was criminally underused but it wasn't until i got to the end that I realised they were changing it up and the 'mask' as it were, was going to be the reveal at the end. Really enjoyed the ending. and Lois, of you beautiful, sweet, smart girl KNEW! With barely a glance, she was there! so freakin awesome. All in all, a great movie. Not as good as the Avengers, imo, but the equal of ANY of the individual lead-in movies for the various characters.